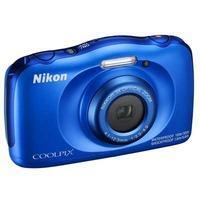 With an easy-to-use interface and dedicated one-touch buttons, the Nikon Coolpix W100 is a simple to operate, 13.2-megapixel compact camera suitable for photographers of all ages. It is waterproof to 10m, shockproof to 1.8m, cold-resistant to -10°C, and dustproof, so is an incredibly rugged camera that can be used in any environment. Perfect portraits have never been easier to shoot.